September 8 through October 7, 2012 – in NYC and Brooklyn – The Festival of New Trumpet Music, directed by Dave Douglas, presents its 10th Anniversary Festival, a multi-genre, multi-venue celebration of new trumpet music by the instrument’s most creative players and composers. Hailed as “a grand highlight of the musical season” by The New Yorker and “a cross-stylistic extravaganza” by The New York Times, FONT Music reaffirms its status as one of the most adventurous and consistently innovative music festivals in the New York scene. Saturday, September 8, 6:30-7pm – Brooklyn Bridge Park, Jane’s Carousel – DUMBO, between the Brooklyn & Manhattan Bridges. FREE! FONT’S 10th Anniversary Celebration and Grand Opening – Rotations, Rotations by Stephanie Richards Rotations, Rotations is a site-specific performance composed and directed by Stephanie Richards, who will be joined by nine moving brass and percussion players performing with the nostalgic sounds of the carousel’s “mechanical band”. Personnel includes Kirk Knuffke and Ben Holmes on trumpet, Brian Drye and Jen Baker on trombone, and Andrew Munsey, Nick Jenkins and Kenny Wollesen on percussion. Wardrobe stylist Sarah Maiorino and movement direction by Mark DeChiazza. September 13-15 – The Jazz Gallery all concerts 9 & 10:30pm, 290 Hudson St, NYC. Thursday 9/13 1st set: $15.00 | $10.00 for Members, 2nd set: $10.00 | $5.00 for Members. Friday and Saturday 9/14-5 both sets $20.00 | $10.00 for Members. Friday, September 14 – Adam O’Farrill Trumpeter Adam O’Farrill performs new music with Luis Perdomo, piano; and Burniss Traviss, bass and Nasheet Waits, drums, and will be joined by a special guest on trumpet. Saturday, September 15 – Taylor Ho Bynum Sextet performing new, “thoughtfully tumultuous” (Nate Chinen, The New York Times) music for his sextet. Dave Douglas Quintet with special guest Aoife O’Donovan – CD Release Concert – Dave Douglas describes the title of his new release, Be Still, as “aspirational.” The continually evolving trumpeter and composer settles down for a ballad-like set that presents a series of hymns and folk songs with an intensely personal connection. Be Still brings out the most lyrical side of Douglas, and introduces both a newly configured Quintet, and an important new collaborator, vocalist and guitarist Aoife O’Donovan. Thursday and Friday, September 20 and 21 – Speyer Hall, University Settlement – 8pm, 184 Eldridge St, NYC. September 20 – The Spaces In Between with Sao Paulo Underground – Cornetist Rob Mazurek and choreographer/artist Marianne Kim’s FONT-commissioned collaboration grown out of the meditative environments of Mazurek’s solo performances at the Rothko Chapel, in Houston, TX and at the Abbaye Royale de Fontevrau, France. September 21 – TILT Brass performs music by Dave Ballou, the latest installment of Nate Wooley’s 7-Storey Mountain, and the New York premiere of Louis Andreissen’s De Volharding for brass sextet and a cast of special guests. Sunday, September 30 – 7 pm – yMusic – 8pm – No BS! Brass Hailed by NPR’s Fred Child as “one of the groups that has really helped to shape the future of classical music,” yMusic is a sextet of young performers equally comfortable in the overlapping classical and pop music worlds. yMusic will be premiering a FONT-Commissioned work by Andrew Norman. No BS! Brass Band is a powerful brass band that embraces the spirit of New Orleans into its original East Coast modern funk. October 4-7 – Jazz Standard – Showtimes 7:30 and 9:30 with an 11:30 set on October 5 and 6, 116 East 27th St, NYC. Jack Walrath, Charles Tolliver and Tom Harrell all perform new music commissioned by FONT Music. October 7 – West Point Jazz Knights featuring Claudio Roditi – The exciting, post-bop oriented trumpeter Claudio Roditi joins the West Point Jazz Knights in a concert of new music by Roditi. FREE! Hosted by Matt Lavelle, this new monthly series will present trumpeters from all walks of life. 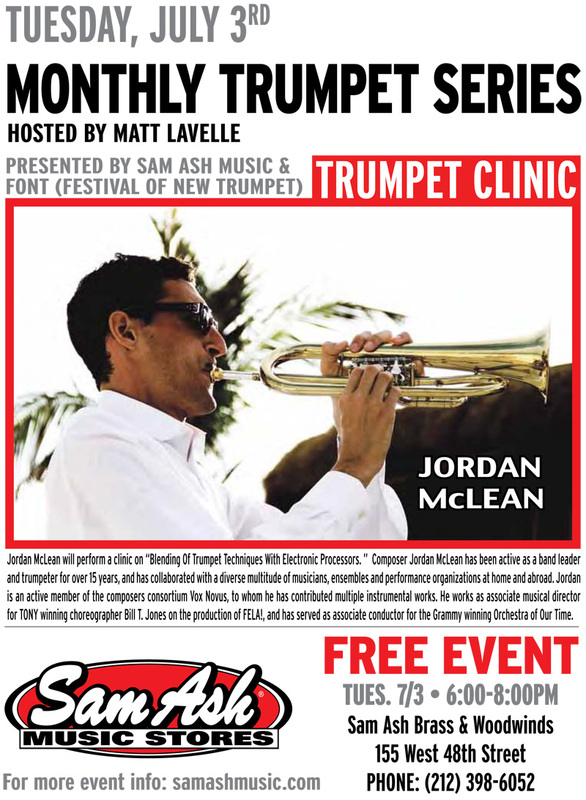 This month, Amir El Saffar will be presenting a clinic on “Trumpet Micro Tones and learning the Maqam”. Amir ElSaffar (born near Chicago, Illinois, United States) is an Iraqi-American trumpeter and vocalist. In addition to being a classical and jazz trumpeter, he is also a skilled interpreter of Iraqi maqam, which he sings and plays on santur. In 2002 he began studying the maqam tradition in Baghdad and London, with Hamid al-Saadi, one of the most renowned maqamsingers in Iraq. He has released a CD of this music and also applied maqam techniques to his trumpet playing. ElSaffan has performed with Cecil Taylor, Simon Shaheen, Randy Brecker, Miya Masaoka, Rudresh Mahanthappa, and Samir Chatterjee.